Already have a Username/Password for Intangible Capital? 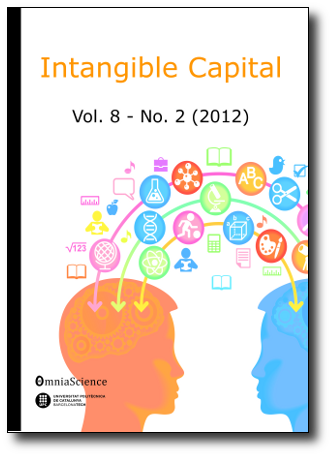 Intangible Capital accepts reviewing scientific articles related to the journal's focus and scope. From 2017-01-01, contributions will be accepted in English, Spanish or Catalan, and they must be original (not published in another journal or any other media). However, if the paper is finally accepted, it must be translated into English. Optionally, the paper can be published in both languages (English and the original language) for an extra cost of EUR 75 per paper. For papers written in poor English, we suggest revising them, whereas papers written in Spanish or Catalan must be translated before publication. In both cases, authors will decide if they want to hire an external professional service (a certificate must be presented with the revision/translation) or OmniaScience’s revision/translation services. Intangible Capital will not assume the cost of this revision/translation, this should be assumed by the authors. If you are interested in OmniaScience’s services, please contact them using this link. Title (and optionally, subtitle): The title must adequately describe the contribution's content. Authors: Authors must NOT include the author's names or any other information about them in the paper. Authors should include the author's names, their institutional affiliation and their e-mails in the intranet during the submission process. Abstract: To produce a structured abstract for the journal, please complete the following fields about your paper. There are four fields which are obligatory (Purpose, Design/methodology/approach, Findings and Originality/value); the other three (Research limitations/implications, Practical implications, and Social implications) may be omitted if they are not applicable to your paper. Abstracts should contain no more than 300 words. Write concisely and clearly. The abstract should reflect only what appears in the original paper. Originality/value: What is new in the paper? State the value of the paper and to who Notes: Footnotes or endnotes will NOT be accepted. Declaration of conflicting interests (required field): In this section the authors will declare if there is some conflict interest. Funding (required field): Before the references section, authors should declare if some people or institutions have financed the research presented in the article. References: Whenever the authors make reference to another author's ideas or results, they must indicate its origin using the adequate citation. The citations must be written in text using APA 5th Edition Style (see template). Appendices: If needed, authors can add appendices to the document that include complementary material useful to other researchers (e.g., questionnaires used in surveys or econometric models). Appendices will be placed after the bibliographical references section, and they must be labeled using capital letters (Appendix A, B, ...), and should have a title descriptive of its contents. As soon as the paper fits the guidelines for authors, the peer review process will start, following the policies described in the peer review process section. The process ends when the article is accepted or rejected. Intangible Capital takes no compromise about dates of publication, and disclaims any responsibility about the contents of the contributions sent to the journal. The journal reserves the right to make modifications to the article's contents, always noticing the authors and respecting their criteria. The submission has not been previously published (or an explanatory note has been included in the -Comments to the editor- section) neither has been sent to other journal for consideration nor is planned to send to other journal until a final decision will made by Intangible Capital. I have read and accept author payment system of the journal. 2. The author/s may hire OmniaScience’s language services. Therefore, I accept to do the revision/translation on my own (hiring a professional revision/translation service) or to hire OmniaScience’s revision/translation services. Note: If your paper has been correctly written in English, please also accept this point, although Intangible Capital will not apply the above considerations regarding paper revision/translation. Authors retain copyright of its works. IC publications are licensed under CC-BY-NC license (Creative Commons Attribution 4.0 International License), granting open access rights to society.